CLEVELAND, OH (March 27, 2006) – The George Whalley Company is introducing a new line of coated throw-away spade drill inserts and coolant holders. The combination of materials and multi-layered coatings provide for a broader range of applications subsequently reducing inventory. 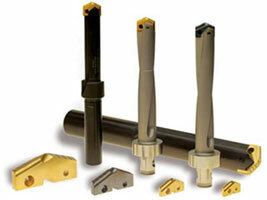 The throw-away spade drill inserts are offered in five different coatings to fit buyers specific drilling needs. The available coatings are Ultra-Tin, TiN, TiCN, TiAIN, and Life-Coat. All of the coatings have distinct features that make them ideal in a wide array of drilling activities. The coatings, in conjunction with the tooling substrates, including high speed steel, cobalt, and carbide, allow for higher speeds and feeds, longer tool life, and reduced machining time. “Our new line of coated throw-away spade drill inserts and coolant holders is an excellent, low-cost tooling technology that can save time and increase productivity”, Howard M. Whalley, Division President. The George Whalley Company Coolant-Fed Tooling and Systemsâ Division has a large inventory of products in stock now and available for immediate delivery. To learn more about this new line and other coolant-fed products please visit www.coolantfedtooling.com.